The HTC Vive is in turnaround. After disappointing some people last year by setting the Vive launch date for well into 2016, the company’s back with a second generation developer model so good, it’ll win back our brains. Developed in partnership with Valve, the HTC Vive wowed us and everyone else who tried it last year. A real-deal competitor for Oculus Rift! Alright! Last week HTC teased a refreshed version of the dev kit, and I’m one of the first members of the media to try it. It’s the last ditch effort to work out the kinks in Vive before its public release in the first quarter of this year. The official name of the device is the Vive Pre. The billboard features are a newly redesigned front-facing camera, a redesigned headset, better base stations for more accurate tracking, and refined ergonomics on the controllers. I was treated by Nvidia to a demo of the Everest VR experience that it has been trotting around recently. The demo takes you on a virtual reality trip up the mountain. It’s part NatGeo documentary—complete with grave voiceover—and part interactive experience. The most compelling part of Everest VR is when you’re asked to follow Sherpa guides on a treacherously-narrow makeshift bridge across a cavernous drop. Though the graphics are great, what really sells the experience are the details. When you look down at the redesigned controllers (more on hardware below) you see little mittens. Before crossing the bridge, you reach out and grab a pair of ascender tools which are attached to wires on either side. Then, you walk. And you walk very slowly and carefully for fear of falling to your doom. Is it possible to die in this experience if you step off the wrong way? I have no idea—I did not intend to find out! As you make your way across the bridge, the controllers vibrate, giving you the sensation that at any moment a gust of wind will come and carry you away. Overall the experience was seamless. After a small hiccup when I first put on the headset, the system ran as planned. The positional tracking of both my body and the controllers felt realistic. I was never disoriented throughout the demo, and thanks to a nice grid that appears when you’re close to the wall, I never felt like I was about to knock myself unconscious. As for the hardware, you can see that the headset has evolved and looks a lot more like a finished consumer product than it did the first time. I found it quite comfortable to wear, though the weight would certainly feel cumbersome after a while. And of course, the headset has wires coming out of it, so it’s not like you’re being released into another dimension without a tether. The controllers also have a fresh look—again, like polished consumer products. The ergonomics have been improved with better edges and textures, but the basic principle is the same: a big wand with a circular touchpad and a trigger for each hand. 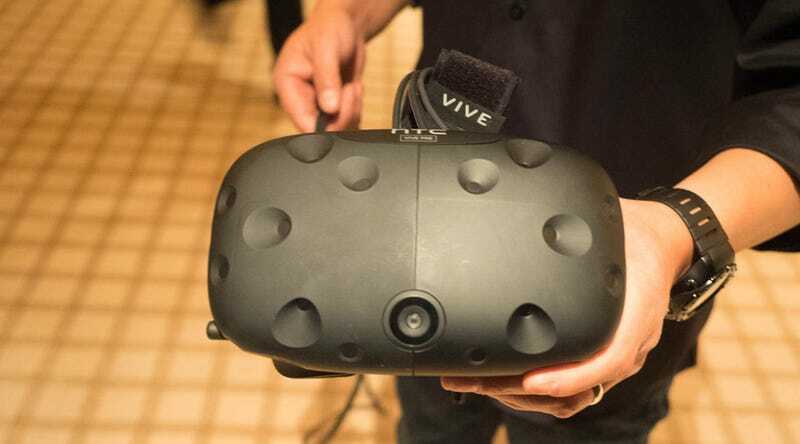 While this isn’t exactly as powerful and refined as the final version of the Oculus Rift, the rapid evolution of HTC and Valve’s technology gives us every indication that we have a lot to look forward to when the Vive launches to the public in a few months.